Extron Electronics has released Extron Control for Android. Extron Control is an AV control system app that gives users access to Extron control systems directly from an iPad, and now from Android devices. Extron Control automatically loads the user interfaces present on many Extron control products without a lengthy setup and customization process. The familiar interfaces emulate the TouchLink Pro touchpanel, eBUS button panel, or MediaLink Plus controller in the room, and all button presses are kept in sync between the app and the Extron AV control device. Extron Control for Android is available for download through Google Play. 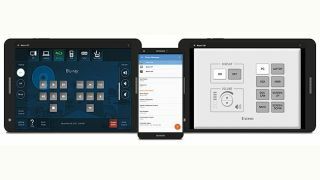 "The Extron Control App became an instant success and remains a favorite app for people who want the convenience of AV room control from their iPad," said Casey Hall, vice president of sales and marketing for Extron. "Now Extron Control for Android opens the doors to countless users who can enjoy the same BYOD freedom from an Android device." Other features include the ability to quickly add and switch between rooms, and auto-reconnect, which recalls the previous session after the app is closed. Extron Control for Android supports all TouchLink Pro touchpanels, eBUS button panels, and MediaLink Plus controllers.